LE Swing Arm Desk Lamp, C-Clamp On Table Lamp, Flexible Arm, Black is currently selling at $22.99, which is its normal price. It has a lowest price of $22.99 and is selling within its usual range. Price volatility is 0.45% (meaning it does not change often), so you might have to wait a while for the price to drop. Until then this is a recommended 'ok deal'. The current deal is also the best price on this item over the last month. 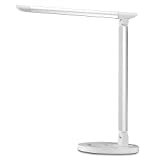 Compare the current price, savings (in dollars & percent) and Buy Ratings for the top Desk Lamps that are closely related to LE Swing Arm Desk Lamp, C-Clamp On Table Lamp, Flexible Arm, Black. 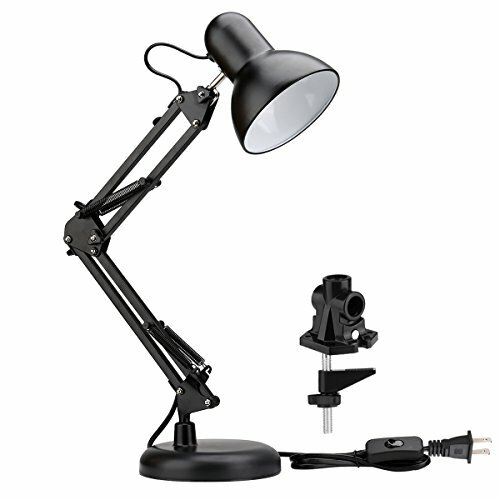 Here is how LE Swing Arm Desk Lamp, C-Clamp On Table Lamp, Flexible Arm, Black compares with other leading Desk Lamps. FlexibleNo longer need to move your books or notebooks around to get it in the light at night. The spring-loaded arm makes it easy to swing up and down smoothly, and the head of the lamp turns around freely.VersatileHandy lamp fits in a number of areas. You can clip it to many places with the C-clamp included.Say, clamp it on a shelf, chair, bedrail, bench, or any other places you would like to.With the heavy weighted base, the lamp can also stand on its own without tripping over.Replaceable bulbsWith an E26 sized screw base, the bulb (sold separately) can be replaced as desired.The wattage of required bulb cannot exceed 100W.Delicate sizeThe elegant body of the lamp provides a beautiful and exquisite style that perfectly suitable for you.It comes with a C-clamp for space saving.The cord of the adapter is long enough to reach the outlet.The clamp is screw-on-type rather than a tension-type, which avoid of leaving bite marks on the desk.SpecificationsLamp Head Size: 123mm/4.84inBase Size: 153mm/6.02inHeight: 540mm/21.26inNet Weight: 1.5kg/52.911ozMaterial: Metal, ABSLength of Leading Wire: 1500mm/4.92ftAbout LELighting EVER, abbreviated to LE, focuses on creating the best lighting experience. Only high end LED and advanced optical design are adopted. Enjoy lighting with LE FeaturesFlexible & Stable: The lamp arm is very flexible with the length of 540mm/21.26incn, and with three joint in the lamp arm, allows you to adjust easily the light in almost any position. 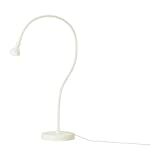 The weighted base is more stable enough to keep the lamp stands firmly.Mounts Anywhere: The lamp base size is 153mm/6.02inch, which can stand on its own or clamp on a table vertical or horizontal.Adaptive Bulbs(Not included): The lamp shade width 123mm/ 4.84inch, with standard E26 bulb base, you can install any of E26 Medium base bulbs and the maximum permissible wattage of the bulb's fuse is 100W, provieds the lamp more lighting choices.Qualified Material: With our qualified metal material on the lamp arm and lamp head as well as the black painted shell, it is a durable and delicate addition in your desk.